View recently posted video of this excellent performance at the Great Hall of the Gnesin Academy of Music. The video is about 20 minutes long and the first twelve minutes or so features a performance of traditional Doukhobor music by the non-Doukhobor music students at Gnesin. This remarkable accomplishment was the result of one year's preparatory work by Elena Minulina (see article below) and was the main component of her defense of her dissertation. The final eight minutes or so of the video features the Doukhobor choral ensemble from the Archangelskoye settlement in Tula Oblast. Earlier in 2013, a traditional Doukhobor choral ensemble from the settlement of Archangelskoye, Tula Oblast, Russia, performed a selection of Doukhobor singing at the Great Hall of the Gnesin Academy of Music in Moscow. 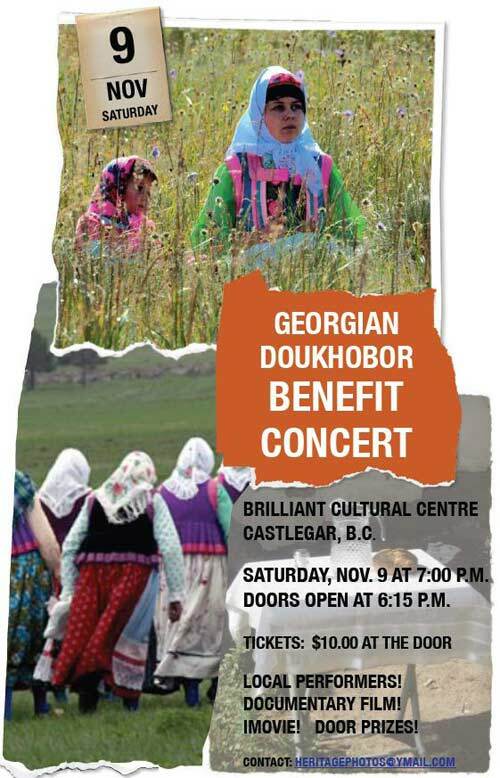 Many of the participants in the ensemble are familiar to Canadian Doukhobors, notably Fred Plotnikoff, formerly of the West Kootenay area of BC, the Baturin family and others. An email about the concert was recently received by the USCC Website from Elena Minulina, who is presently working on her dissertation about Doukhobor music, entitled, "Doukhobor psalms: the performing aspect". Ms Minulina states that the Gnesin Academy organized several research expeditions to the Doukhobor settlement in Archangelskoye, and that, in her own work, she has also made a study of the Doukhobor Song Library on this Website, as well as the writings of Dr. Kenneth Peacock, who did an extensive study of Doukhobor music in the 1960s, on behalf of the National Museum of Canada and published the definitive book on the subject, Songs of the Doukhobors (Ottawa, Canada 1970). The Kelowna Doukhobor Group would like to invite all of our family, friends, and new friends to join us for our annual Christmas celebrations. Our celebration features a prayer service, potluck luncheon, Christmas activities, performances, a Christmas themed raffle and a visit from our very own Russian Santa! Please help us to share the warmth of the holiday season with others - a non-perishable food item, or cash donation for the Kelowna Community Food Bank would be greatly appreciated! Every year during our Christmas Eve program at the Brilliant Cultural Centre we feature photos, messages, and short videos (under one minute*) from people who aren't able to be there but would still like to pass along their Christmas greetings. Please forward this message to your family and friends who either live outside of the Kootenays or who are unable to attend the program in person and encourage them to compose messages and send us their Christmas photos! To have greetings shared during the program**, photos and messages should be sent to Marissa Kalmakoff at: marissakalmakoff@gmail.com by the 10th of December. Thank you for helping to make our Christmas Global Messages a hit and we hope to see you all at the Christmas Eve program. *The Youth Council reserves the right to edit footage for time management purposes. "Help Russian Doukhobor young people visit Canada"
Earlier this spring, the USCC Doukhobor Cultural Roots Fund, endorsed by the Russian Liaison Committee, has been set up to help two Russian Doukhobor women visit Canada. The purpose of the fund is to raise enough money to pay for travel expenses for Marina Kariva (38 years old) from Rostov-on-Don and Kristina Foflina (26 years old) from the village of Tambov to visit the Kootenay/Boundary area for the 2014 Union of Youth Festival and experience, even if briefly, life in Canada. Doukhobors from Russia cannot afford travel expenses to visit Canada. The objective is to raise a total of approximately $5,000.00 – $6,000.00 to ensure that travel costs, incidentals as well as a monetary gift for shopping are covered. Preliminary plans and arrangements are based on a three week visit in Vancouver, Grand Forks and the Kootenay area. Many Canadian Doukhobors have travelled to Russia and received a warm welcome and gracious hospitality while visiting our Russian Doukhobor brothers and sisters. We hope to reciprocate this friendship by hosting these two young women. Exchange visits help strengthen ties to our ancestral homeland, both spiritually and culturally, while at the same time provide an opportunity for young Russian Doukhobors to experience the rich multicultural mosaic of Canada as well as connect with relatives. We ask for your group's support. 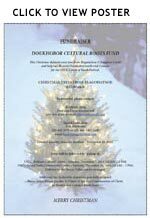 Donations can be made to the Doukhobor Cultural Roots Fund at the Brilliant or Grand Forks USCC offices. Personal donations are tax deductible. Please make cheques payable to: Union of Spiritual Communities of Christ, re: Doukhobor Cultural Roots Fund. When the travel plans and dates are confirmed, we will have a meeting to plan the itinerary for our guests. All those who are interested in inviting the women to their home, please let us know so that your requests are considered. Also, we are planning on assembling a variety of small gifts and tokens from our Doukhobor community. If anyone or any group would like to contribute to this collection, please let us know. As an additional fundraising project, we invite you to purchase a Christmas tree from Blagodatnoe. We thank Champion Creek Forest Management for the complimentary trees as well as to all who planted the seedlings about 5 years ago. USCC Grand Forks Community Centre on Saturday, December 14, 2013 (10 AM – 2 PM). Delivery to the Slocan Valley can be arranged. Let us all make Marina's and Kristina's visit to our area memorable, a once in a lifetime opportunity for two Russian Doukhbor women. October 16, 2013 - Make Some Extra Spending Money for the Holidays! 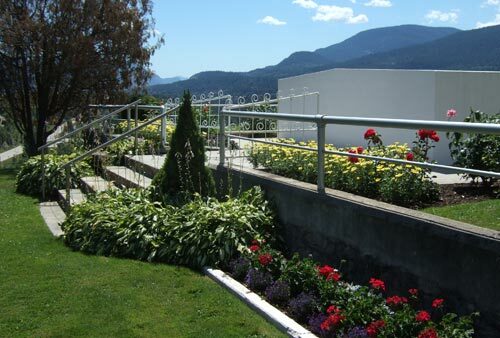 USCC Committees and designated volunteers are seeking additional volunteers to help with the annual fall clean-up at the Verigin Memorial Park in Brilliant (Castlegar, BC). A beautiful setting that is the interment site of Doukhobor leaders and an important venue for various Doukhobor traditional spiritual gatherings, the Memorial Park has been designated as a provincial Heritage Site, and attracts thousands of tourists and other visitors each year. "A work party to carry out the annual fall clean-up is scheduled for 9:00 AM, Saturday, October 19, 2013, and will require up to several dozen volunteers. Everyone is welcome, from teenagers to all ages. Those wishing to help out may register with the Secretary at the Brilliant Cultural Centre during regular office hours, Tuesday through Thursday. See "Contact" information, elsewhere on this site. The Kootenay Doukhobor Historical Society is inviting all members of the community to a "Community Appreciation Open House" on Sunday, September 29, 2013 at the Doukhobor Discovery Centre (Doukhobor Village Museum) from 10 am to 5 pm. Come and see the fully restored grist mill and all the other improvements that have taken place over this past summer. Bring family, friends, a picnic lunch and enjoy a leisurely day viewing the various displays in and around the grounds of the museum. 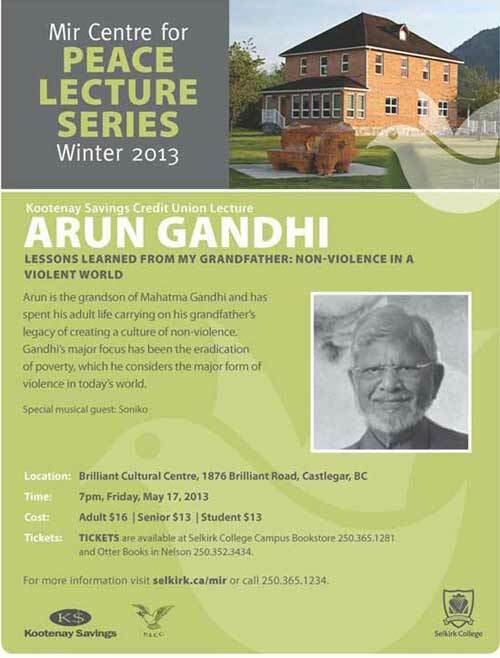 An open mic will be available – admission is by donation. Thanks to Kootenay Market for the donation of cookies and light refreshments. International Day of Peace is just around the corner. On September 21st thousands will gather around the world to state clearly that we are working together as one family to say that Peaceful Living is the common quest, need and desire of the world's people. This peace does not involve military interventions, attacks, occupations; nor does it involve abuse or violence by anyone against anyone. The Boundary Peace Initiative, along with our co-sponsors, The USCC Working Groups and KRUNA, ask you to join us on Saturday, September 21st at 2:00 PM in Grand Forks, B.C at the Slavonic Senior Citizens Center on 72nd Ave and 7th St for a program with the theme - "Defining Peace and Exploring How to Live it". 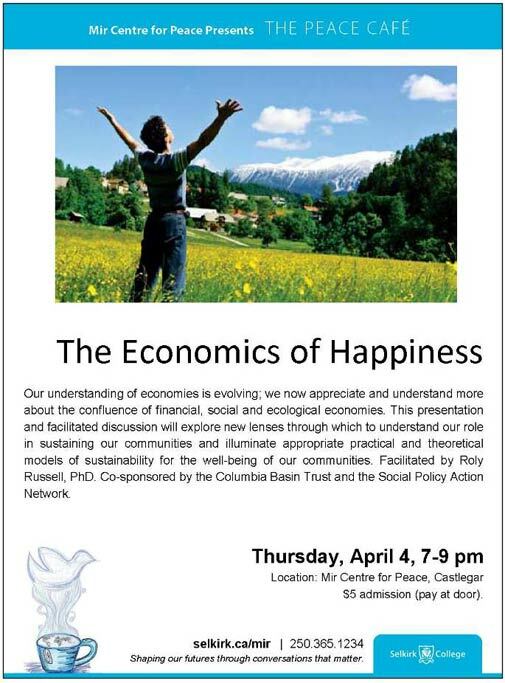 Admission for this event is by donation to cover cost of rent. Also, the Slavonic Seniors hold their monthly vegetarian potluck that day and they are inviting all to come share time and food together by either bringing a vegetarian dish or contributing $6. 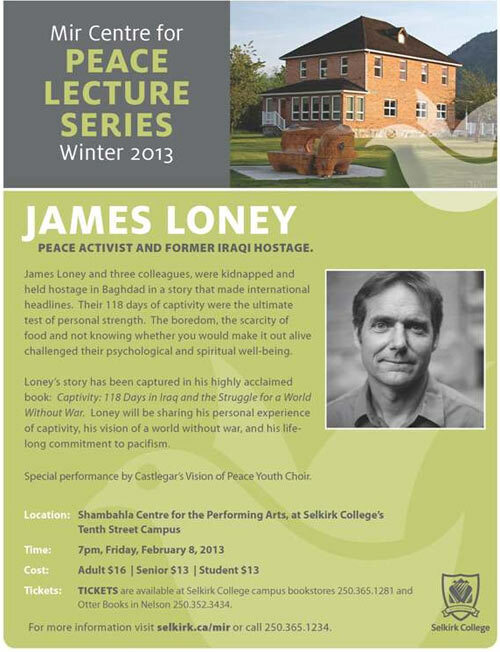 We look forward to seeing you and ask that you spread the word to all your family and friends to join us either in Grand Forks or Castlegar for these planned events or you can take the initiative and organize a gathering in your community - the gathering can be big or small, but the idea is to join all our voices together in calling for a cessation of war and violence. Peace lives because we live it. August 27, 2013 - Grand Forks Lapsha Ladies celebrate a quarter century! In 2013, the Grand Forks Lapsha Ladies are celebrating their 25th consecutive year of service to the community. Not only have they fed thousands of appreciative people with their delicious noodles, but they have also contributed thousands of dollars in support of numerous worthy causes. As the grateful beneficiary of some of that generous support, the USCC Website is happy to have a special page added in recognition of this inspiring group of women. 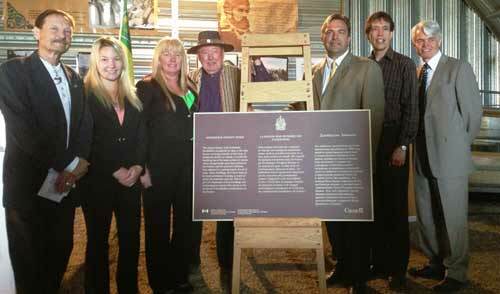 The Kootenay Doukhobor Historical Society is pleased to announce the presentation of a $68,000 infrastructure grant by the Honorable John Duncan to the Doukhobor Discovery Centre on behalf of The Honorable Michelle Rempel, Minister of State for the Western Economic Diversification Fund. The much needed funding will make a significant difference in the implementation of infrastructure improvements at the Doukhobor Village Museum. President, Peter Perepolkin along with Museum Administrator, Lisa Poznikoff had the opportunity to showcase the museum and grounds to the Honourable John Duncan, Minister of State, the Chief Government Whip and Member of Parliament for Vancouver Island North along with his wife Donna Richardson by taking them on a tour of the facility after the official presentation at the Castlegar Recreation Centre. It was privilege to show Minister Duncan the infrastructure improvements that have taken place to date, as well as scheduled upgrades to be completed later this fall. Minister Duncan and his wife were genuinely interested in the history of the Doukhobors as they spent nearly 3 hours asking questions and touring the buildings. 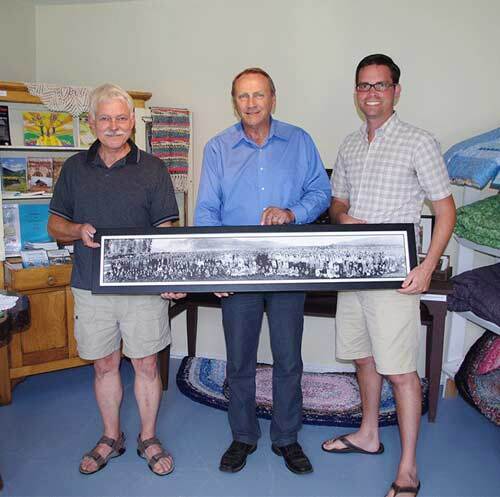 On behalf of the Society and the Discovery Centre, President Peter Perepolkin presented the Minister and his wife with a framed print depicting a Sunday Gathering of Doukhobors in Ootischenia on May of 1928, a gift which the Minister was genuinely moved to receive. July 11, 2013 - Local Musical Act, The Grasshoppers, finally make it to the "Cover of our ISKRA"
Read about the Grasshoppers in the current issue of ISKRA. You may also listen to their Youth Festival rendition of an old cover song they sang as teenagers, using our online player below. From left to right: JJ Verigin – Executive Director of the Union of Spiritual Communities of Christ; Clearisha Cheveldayoff; Brenda Cheveldayoff – founder of site; Larry Ewashen – historian; Ken Cheveldayoff – Saskatchewan Party MLA for Saskatoon Silver Springs and Provincial Minister of Environment (Saskatchewan); Maurice Vellacott – Conservative MP for Saskatoon-Wanuskewin (Saskatchewan); Allan Duddridge – Saskatchewan representative for Historic Sites and Monuments Board of Canada. June 14, 2013 - Doukhobors: Community of Faith. A new film about Doukhobors in Georgia. The worldwide RT Network (Russian Television) has recently broadcast a very interesting new film about the Doukhobors still remaining in Southern Georgia. 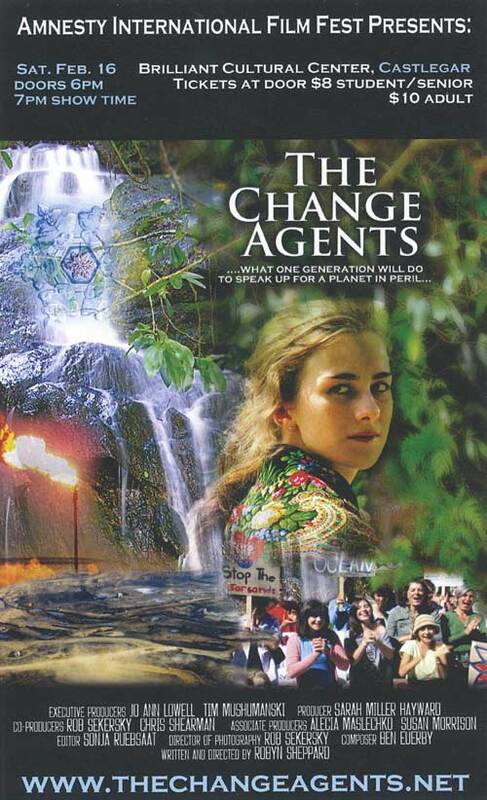 To view the film, use this link to the RT Website. To read a review of the film, by Koozma J. Tarasoff, use this link to his blog. Our Doukhobor History - Commemorative Signage Dedication Ceremony, with John J. Verigin, Slocan Valley Choir, Peter Relkoff and other guests. Thanks to our dedicated video crew, we now have a video record of another spectacular Union of Youth Festival. We have exported these new videos from the BCC USTREAM account and archived them on our website where we are pleased to make them permanently available for your viewing convenience - without distracting commercials. As with many web-related tasks, video management is never simple and our web group would appreciate your feedback if you encounter errors in video titles, sequencing and numbering as you view these videos. Please note that unlike true video streaming websites such as Youtube and USTREAM, our videos can not be fast-forwarded effectively. But if you observe the video progress bar under the playing video, you will notice movement on a red marker as well as a gray marker. The gray marker indicates the actual video download progress, which is generally faster than the red marker which indicates real-time play mode. To fast-forward, you can move the red marker ahead within the gray area to advance video, at least in a limited sort of way. This is not ideal, but all we can do at this time. Also - you are reminded to STOP video download or close the video page when your are done viewing videos. We are experiencing a high volume of video downloads and would appreciate your assistance in controlling bandwidth excesses. Thank you for your patience. Please note that only the Saturday Evening Program cameras will be manned or monitored. Other coverage will be streamed from a fixed stationary camera. UPDATE: This broadcast recording is now posted on our video page here. Greetings from the USCC Union of Youth Council. This coming May long weekend marks the 66th year of our annual USCC Union of Youth Festival. The USCC Union of Youth Council would like to extend a warm invitation to our greater community to come and join us as we celebrate culture, food, talent, and heritage. This year also marks the 70th Anniversary of our Iskra publication, and it seemed only fitting to us to honour this occasion with the inspirational theme: "The Spark Within." With this theme we ask: "What awakens you?" To us, the word "awakens" could incorporate inspires, motivates, fuels, recharges, enlightens and any other feelings that may be associated with the most important things in your life. 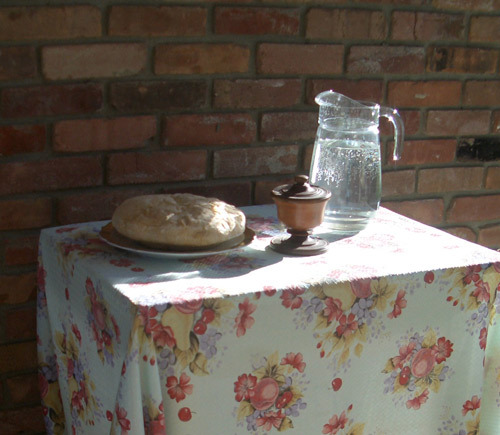 This exciting weekend is a time to come together with family and friends from near and far and celebrate Doukhobor culture through performance, nourishment, language, culture, and prayer. Our weekend begins on Saturday morning at 10 a.m. with the Children's Sunday School Festival. Next on the program - from 2 to 4 p.m. - is our afternoon segment which showcases a variety of choir performances, talents, and traditional Doukhobor song. The evening program commences at 7 p.m., and incorporates light-hearted entertainment, comedy, and a cappella choirs from all over B.C. Tickets for the Saturday evening program are by advance sales only and available in early May at the Brilliant Cultural Centre. On Sunday morning, our prayer service will begin at 9 a.m., followed by a psalm study and choir performances at 10:30 a.m.
We are fortunate this year that the talented Kootenay Ladies Organization has offered to serve borscht at as sit-down lunch following the morning program. Tickets will be sold throughout the event. Following the traditional Doukhobor lunch, the last segment of our cultural weekend showcasing more performances by various choirs and a Grand Finale presentation, will commence. This year, on Sunday, we are continuing our celebration at 5 p.m at the Brilliant Bridge observation deck, for the opening ceremony. To conclude our weekend, a Sports Day will be held Monday, May 20 at 11 a.m. at the field behind the Brilliant Cultural Centre. We encourage and welcome all members of the community, young and young-at-heart, to join us in various sports day games and a traditional soft-ball tournament. We believe it is important to all of us children, youth, adults and elders, to contribute to the betterment of ourselves, our families, our organization and our broader community. Therefore we invite you all to collectively celebrate each other and welcome your participation in our 66th annual USCC Union of Youth Festival. 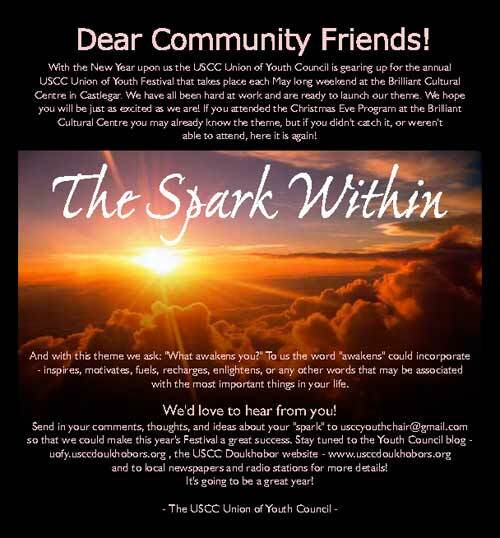 For more information, please contact Kalina Repin, Union of Youth Chairperson, at kalina.repin@gmail.com or Val Samsonoff at the USCC Castlegar office at usccbcc@shaw. ca or (250) 365-3613. April 06, 2013 Doukhobor Song Library back online!.. As many visitors have noted, the Doukhobor Song Library (DSL) Website, which is normally a click away from our Links Section, has been inaccessible for the past few months. The USCC Web Group is happy to announce that it is again available for use by the wide assortment of Site visitors in Canada and abroad, as indicated by the questions and inquiries we've received since it went offline. While the DSL Site has not been under the direct administrative control of the USCC Web Group, it has always been considered an important part of the USCC Web Cluster, and has evolved over two decades of USCC-sponsored development, with dozens of volunteers as well as periodically hired technical support. When the DSL Website inadvertently encountered the Malware "infection" that temporarily blocked its use, it fell to the USCC Web Group to remedy the situation, which turned out to be more of a challenge than had been initially foreseen. However, an effective resolution was attained and we are happy to have the DSL online and usable again! The USCC Web Group would like to gratefully acknowledge Marjorie Malloff, former ISKRA Editor and a key pillar in the development of the DSL, for her cooperation and assistance in resolving the recent challenges with DSL, and Peter Rezansoff, who (along with his wife Elsie) has been our foremost Website benefactor, and who has provided a cost-free hosting server for the Song Library site up to this time. While the DSL is already a very valuable resource, much further development is envisioned (and will be pursued, as resources allow) in order to make this an even more comprehensive tool for the preservation and development of the unique and culturally rich Doukhobor a cappella singing tradition. The USCC Web Group looks forward to collaborating with all other available contributors in order to attain the vision in the most effective way possible. All DSL visitors and users are also encouraged to send in their suggestions and comments. Click here to view DSL website. The DSL is also once again accessible through our Link Section, here. We have confirmed that the USCC Ustream video team will be broadcasting live video of the upcoming talent show, beginning at 7:00 pm on Saturday March 9, 2013. For those attending in person, the doors to the centre will be open at 6:00 pm. The talent show is scheduled for Grand Forks the following Saturday, March 16th, same times. 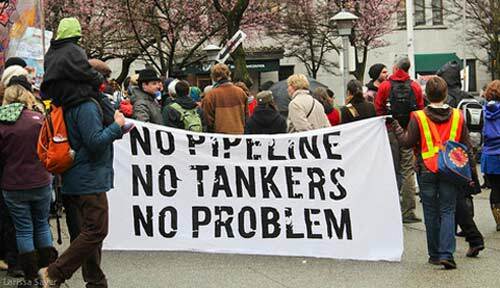 The Kootenay Region Branch of UNA - Canada is inviting choirs, singers, and friends to participate in the upcoming event "Gathering of Eagles - Convergence For a Pipeline & Tanker Free BC" - June 2, 2013 (Changed from April 14, 2013) at the Brilliant Cultural Centre. 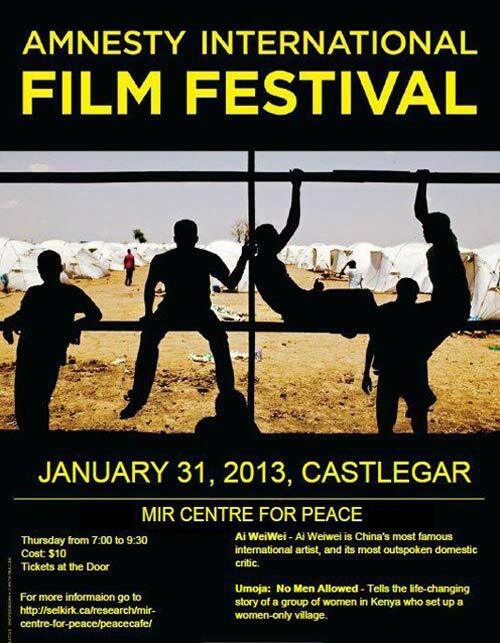 January 23, 2013 - Amnesty International Film Festival - Mir Centre. January 17, 2013 - USCC Union of Youth announce 2013 spring festival theme.